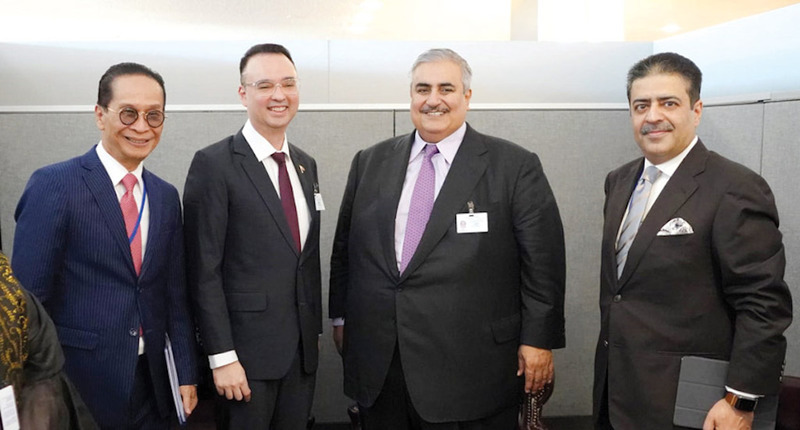 The Minister of Foreign Affairs, Shaikh Khalid bin Ahmed bin Mohammed Al Khalifa, met Secretary of Foreign Affairs of the Republic of the Philippines, Alan Peter Chramm Cayetano, on the sidelines of the 73rd Session of the United Nations General Assembly UNGA – 73 in New York. The meeting was held in the presence CEO of Labour Market Regulatory Authority and Chairman of the National Committee to Combat Trafficking in Persons, Osama bin Abdullah Al Absi. Minister Cayetano asked the Minister of Foreign Affairs to convey the sincere greetings of President Rodrigo Duterte to His Majesty King Hamad bin Isa Al Khalifa and to His Royal Highness Prime Minister, Prince Khalifa bin Salman Al-Khalifa as well as to His Royal Highness Prince Salman bin Hamad Al Khalifa, Crown Prince, Deputy Supreme Commander and First Deputy Premier, wishing them good health and happiness. During the meeting, the Foreign Minister affirmed the keenness of the Kingdom of Bahrain to develop its friendly relations with the Republic of the Philippines and to advance bilateral ties to wider horizons at different levels as well as to diversify the fields of bilateral cooperation for the interest of the two friendly countries and their peoples. Alain Peter Cayetano expressed his country’s pride in its distinguished relations with the Kingdom of Bahrain and its profound appreciation for the great care enjoyed by the Filipino community in the Kingdom, which reflects the Bahrain’s openness, coexistence and tolerance. He also hailed the great efforts exerted by the Kingdom of Bahrain in eliminating trafficking in persons, wishing it further progress and prosperity. This entry was posted in BNA and tagged Ausama AL Absi, combat trafficking in persons, Foreign Minister, Republic of the Philippines by Labour Market Regulatory Authority. Bookmark the permalink.